Why Donald Trump is so obsessed with IQ and genius. It’s no surprise that Donald Trump is so obsessed with two of the most dangerous concepts in education history. 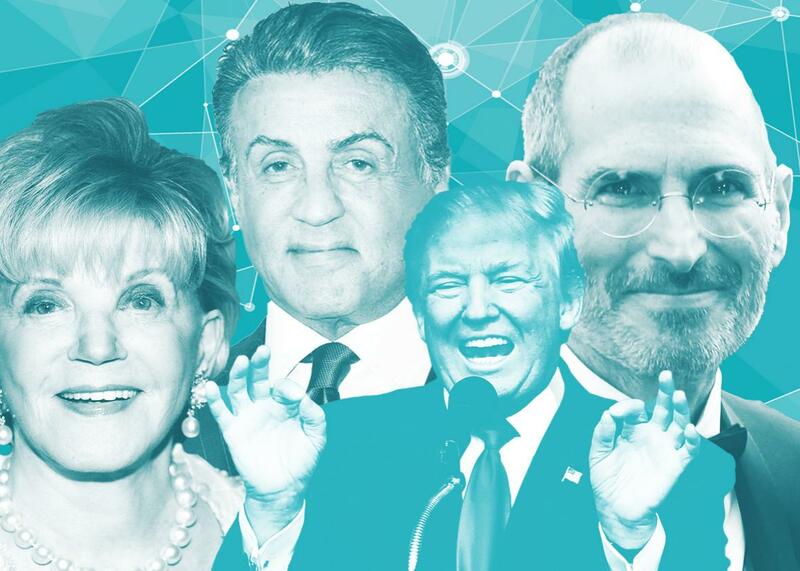 Donald Trump with those whom he regards as fellow geniuses: romance novelist Judith Krantz, actor-filmmaker Sylvester Stallone, and the late Apple co-founder Steve Jobs. As a journalist who focuses on education, I’ve mostly been able to avoid writing about Donald Trump during this election campaign, luckily enough. But now I feel I must weigh in! I’ve noticed that Trump is obsessed with two of the most dangerous concepts from education history: genius and IQ. In Think Like a Billionaire (2004), Trump explains that he got some of his best investment ideas in his early 20s, when his own genius was purer and less corrupted by experience. “Genius is the ability to assemble in new forms what already exists, and sometimes the youngest people are the greatest geniuses,” he states. Who (besides himself) does Donald Trump consider a genius? Sylvester Stallone, who is “a genius purely by instinct,” and Jean-Georges Vongerichten, who runs a restaurant at Trump’s Central Park West hotel (and whose ginger fried rice, in my opinion, truly is genius). As befits a man who loves to cite his own poll numbers, Trump seems to believe that popularity is itself evidence of genius. He writes that Woody Allen and best-selling romance novelist Judith Krantz are geniuses for their ability to “know their market” and give audiences exactly what they want. How does Trump’s concept of genius compare to history’s? As Dartmouth professor Darrin McMahon explains in his fascinating book Divine Fury: A History of Genius, the word dates back to ancient Rome, where it was used to describe a spirit or familiar, able to intercede on one’s behalf with the gods. Think of a genie, or, from the Arabic, a jinn. During early Christianity, a genius was a sort of angel who could protect a church or nation. It was only during the Enlightenment, when religion receded, that genius became something a man could be as an individual, instead of something a man could have as an ally. (And yes, genius was, from the beginning, considered an almost exclusively male phenomenon.) It was now men, not gods, who created the world, and in the 18th century, Shakespeare, Benjamin Franklin, and Cardinal Richelieu were all hailed as geniuses. These modern geniuses were powerful, creative, free-thinking, and sometimes, also, a bit scary. Descartes wrote of a deceitful “evil genius … very powerful and very cunning.” Genius was often described as a fire or uncontrollable “enthusiasm.” It was not purely intellectual, nor a matter of studying hard to gain knowledge of the world. Rather, genius was an inborn trait, something that marked a few men as exceptional from birth. A genius could be an artist at the brink of madness, like van Gogh, or an evidence-based scientist, like Newton or Einstein. Hitler, too, was recognized in his heyday as a type of demonic, charismatic genius. And I must admit, when I watch Trump enthrall a ravenous crowd at one of his rallies, I do see a dark sort of genius for feeding off people’s shame and fear. Trump’s adoration of IQ testing recalls an especially disturbing period in the history of genius: the late 19th and early 20th century, when social scientists attempted to measure and compare people’s intelligence. The pseudoscience of phrenology claimed that genius could be identified by examining the shape of people’s skulls. Alfred Binet, the pioneering French psychologist, experimented with phrenology but was ultimately dissatisfied with that technique. In 1905 he developed the first IQ test, which was originally intended to identify children with learning disabilities. IQ quickly enraptured American researchers, who were eager to find a scientific justification for the nation’s racial hierarchy. Carl Brigham, who later developed the SAT, studied the IQ scores of over 1 million World War I recruits. Brigham and colleagues claimed that the scores showed native-born whites as the most intelligent group, followed by immigrant Italians and Jews, and then black Americans. But IQ exams have never tested innate smarts. The questions asked on early IQ tests—about the author of The Scarlet Letter, the diet of squirrels, and the city where the Declaration of Independence was signed—required background knowledge. It was unsurprising that poor people, with less access to good schools and less familiarity with middle-class white American culture, scored lower. Nevertheless, low IQ scores were frequently used as a justification for sterilizing and incarcerating people. Despite overwhelming evidence that IQ is a social construct that favors the wealthy, there are always commentators willing to argue for public policy tied to IQ scores, from curricular tracking to immigration restrictions. In 2013, an analyst at the Heritage Foundation, Jason Richwine, lost his job after the media discovered his dissertation, which cited what he called the “IQ disparity between Hispanics and non-Hispanic whites” and “the persistently low IQ of Hispanic Americans” as supporting his argument that individual IQ test scores should be used as a basis for admitting immigrants to the U.S.* Richwine’s work largely ignored the well-established impact that family income and school quality have on IQ scores, yet his dissertation earned him a Harvard Ph.D. So Trump is hardly alone in valorizing IQ. It is no shock that a man obsessed with the superiority of native-born, white, and male people is drawn to a “science” that replicates social hierarchies. And yet, I’d argue that we’re all implicated in the tenacious hold of the IQ score. The idea of measuring our own genius enthralls us. A simple web search turns up dozens of free IQ tests. I spent 20 minutes taking one exam, which timed me while I answered questions about whether a square of a certain size could fit into a certain size pentagon and whether the word mineral could be spelled using only the letters found in the word parliament. My score was 116, or “high average.” The test was just spam, but I was disappointed. Apparently, I’m not a genius! Historian Darrin McMahon writes that this belief that anyone can be a genius is a hallmark of postwar American self-help culture. He also notes that today’s most celebrated geniuses—Steve Jobs, Bill Gates, Jeff Bezos, and a long list of actors and sports stars given the moniker—are generally also rich. “Genius, in the American way, was not just thinking new thoughts and creating new things,” McMahon writes, “but finding a use for them, and then using them to make a buck.” What could be more Trumpian than that?